A company in Germany that operates a chemical testing laboratory was one of the first Alpha Pump Test Sites for the MT8 triplex metering pump. The company was looking for a pump that could provide consistent delivery at different flows and pressures for a variety of aqueous and solventbased pigment emulsions. 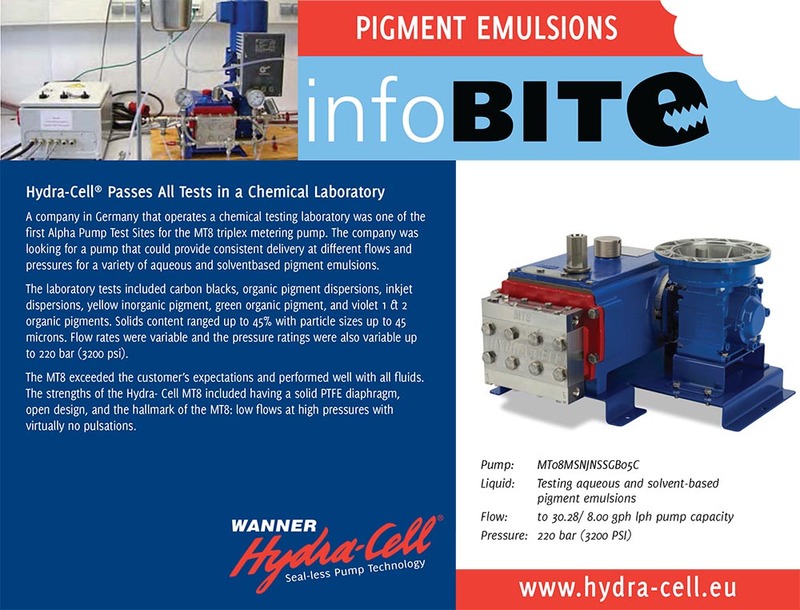 The laboratory tests included carbon blacks, organic pigment dispersions, inkjet dispersions, yellow inorganic pigment, green organic pigment, and violet 1 & 2 organic pigments. Solids content ranged up to 45% with particle sizes up to 45 microns. Flow rates were variable and the pressure ratings were also variable up to 220 bar (3200 psi). The MT8 exceeded the customer’s expectations and performed well with all fluids. The strengths of the Hydra- Cell MT8 included having a solid PTFE diaphragm, open design, and the hallmark of the MT8: low flows at high pressures with virtually no pulsations.